The Wine Advocate - A little gem of an estate owned by the Perse family, the 2011 Bellevue Mondotte is composed of 90% Merlot, 5% Cabernet Sauvignon and 5% Cabernet Franc. 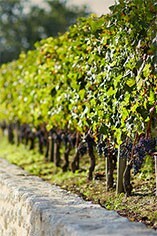 This super, highly concentrated wine (please dont make the mistake of saying over-extracted as there is not a bit of bitterness to be found) is the product of tiny yields and a late harvest. A thick, port-like, black/ruby/purple color is followed by a powerful, rich, exceptionally pure wine with stunning balance. From a vintage where most wines will need to be consumed within their first 15-20 years of life, this cuvee will undoubtedly last 30 or more. Wine Spectator - This is not shy, with clearly extracted fig, boysenberry and plum fruit flavors that are liberally laced with blueberry pâte de fruit, cassis and ganache. The long finish lets the toast and spice pyrotechnics play out, with a saturated yet driven feel. Parker - This backward, primary wine may have just finished malolactic fermentation. From a tiny vineyard owned by Chantal and Gerard Perse, the fruit was harvested on September 17 at a microscopic 22 hectoliters per hectare. Composed of 90% Merlot, 5% Cabernet Sauvignon and 5% Cabernet Franc, the 2011 Bellevue Mondotte is the most powerful wine in the Perse portfolio, coming in at 14.5% natural alcohol (more similar to 2009 and 2010 than most 2011s). From a great terroir (just across the street from Stephan von Neipperg’s La Mondotte), the wine exhibits massive, full-bodied power, extraordinary depth and richness as well as a boatload of tannins that have yet to soften and mellow. This appears to be a long-term proposition for most readers. I suspect it will soften considerably during its upbringing in oak barrels, and will undoubtedly require 5-6 years of cellaring after its release in 2014. If you are young, wealthy and have a lot of patience, purchasing this wine should be a serious consideration as it should turn out to be one of the great 2011s. 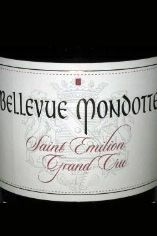 Chateau Bellevue Mondotte is a tiny, 2-hectare wine property on the limestone plateau of St Emilion, bought in 2001 by Gérard Perse, owner of the celebrated premier Grand Cru Classé Ch. Pavie. Merlot comprises over 90% of the blend with a dash of both Cabernet Sauvignon and Cabernet Franc. The vineyard faces south at an altitude of 80 metres above sea-level, and the average age of the vines is 45 years. The wine falls very much into the garagiste camp, being aged in 100% new oak and produced from tiny yields of 15-20 hectolitres per hectare. Michel Rolland is the consultant oenologist. After 6 months ageing on its lees the wine remains in barrel for a further 18 months before being bottled unfiltered and unfined.